October 23rd, 2014AWM: Can I create a bottom menu that its submenus pop up? I have a website with a menu that no longer works in IE 10 or 11. It is unusual in that the menu bar is at the bottom of the page, and instead of dropping down, it pops up above the link. If I get your AllWebMenus Pro, is there a way to be able to create this? Will it work in all versions of Internet Explorer (I tend to call it Internet Exploder)? Yes, you can create that kind of menu with AllWebMenus Pro. If you position your menu relative to Window at the bottom, the following result will be automatically created, as the submenu automatically will open above the main menu items. Of course, you can also do more settings on this. If you wish, you may download AllWebMenus Pro http://www.likno.com/download.html and give it a try. AllWebMenus produce menus that will work alike in all modern browsers (including Internet Explorer 10 and Internet Explorer 11) and all devices (tablets/smartphones). I have AllWebMenus version v5.3.826 installed, when I used the menu in IE 10 with the positioning in a Relative Element, when I use the scrollbar in IE the menu don't move with the page and stay out of the place where it should be. If I update the program this problem will be resolved ? 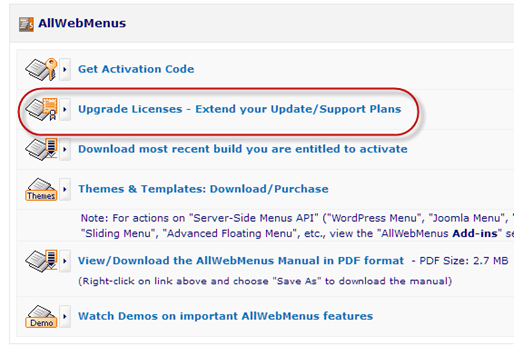 Yes, the latest version of AllWebMenus fully supports IE10, as well as all the latest browsers and mobile devices. After you update, please recompile your menu and remember to upload both the “menu.js” and the “awmdata” folder. I have used the DHTML menus on several websites and this one I am having trouble with it not appearing in IE8 and IE9. I checked the knowledge base and made sure that this menu was compiled with the most recent version. It seems that the problem is caused by a single line in your CSS! This “height: 50px” affects the .topnavarea and causes the menu to move to the right. It is not invisible, it is just moved off-page creating a horizontal scrollbar. Please try correcting this to fix the problem. My new main nav bar works in IE but it goes off the page in Firefox? The site is live now. I never had a problem with it fitting. I did add one ore menu item, but I played around and it fit fine. I never had your program give me this kind of error, it always seem to work across all browsers. I checked your page in various browsers and I see that this happens in most browsers, even in older versions of IE. The reason your menu fits in IE9+ is that IE has a special font rendering engine that makes fonts a bit smaller in width. The solution is to make your menu smaller (e.g. by removing 1-2 pixels from the empty space between each item pair) and then set the minimum width to 940px in order to make sure that it has the same size in all browsers.